Ang Thong National Marine Park is one of the greatest natural treasures of Thailand. It is composed of nearly 60 large and small islands, some of which are considered some of the most beautiful of our planet. Used in past studies of the Thai Navy. Today the islands forming the Ang Thong archipelago form part of the territory of the National Marine Park area. Its location is about 30 km northwest of the city of Ko Samui. 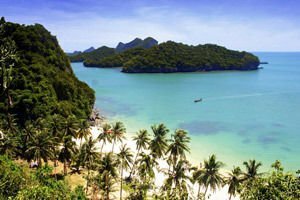 The name “Ang Thong archipelago” literally translates as "golden cup." The island group is located in an area of 250 sq. km. with all its constituent units differ fundamentally from one another. The beauty of each island is unique, and most of them are baptized with the name corresponding to their appearance. For example, there is an island that is called "Sleeping Cow" and another island known as, "The three pillars." About 50 square kilometers are occupied in limestone karst islands, which are characterized by steep cliffs and bizarre rock formations, snow white sandy beaches and romantic small lagoons. The beauty of Ang Thong can hardly be inspired with words. Perhaps the most attractive islands here are Ko Samui, Ko-Pa Ngang and Co. Tao. Aquamarine waters gradually and slowly invaded by white sand is an attractive place for thousands of tourists every year, but there were no major tourist masses here, which makes the place quite easily accessible. Another reason archipelago is a favorite resting place is the excellent water conditions for diving among the amazing coral reefs. Visitors here can stay in a bungalow in Co Vua Ta Lap. Also offered are tours Boats and kayaking in coastal areas. Many visitors rent a boat and look for beautiful seaside places to dive. Some of the nearly 60 islands are completely uninhabited and challenge fans of extreme sensations. On the other hand, one can enjoy hiking trails that lead through lush forests to higher parts of the island. Quite attractive in Ang Tong, is salt lake on the island of Koh Mae Co., which is surrounded by very steep cliffs. The transition to it is quite complex with long climbs, but once you get to it, you will find that the end justifies the means.